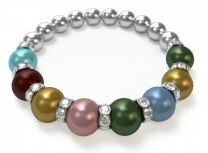 The bracelet itself is very pretty. I was a little disappointed in the color of the pearls. 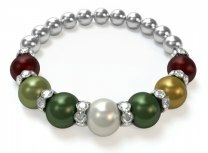 The pearls representing May (emerald) and January (garnet) looked different than pictured. The emerald pearl is very dark. The bracelet is as I expected. It arrived early than expected. I enjoy wearing it and being reminded of my family. Very pleased with my beautiful purchase, fast service, quick delivery. The bracelet is much prettier in person. Great quality. I was amazed at how fast this lovely bracelet arrived and the quality of the bracelet! Love it! Love showing off my beautiful bracelet! Just added the Garnet for my newest edition baby boy #2.